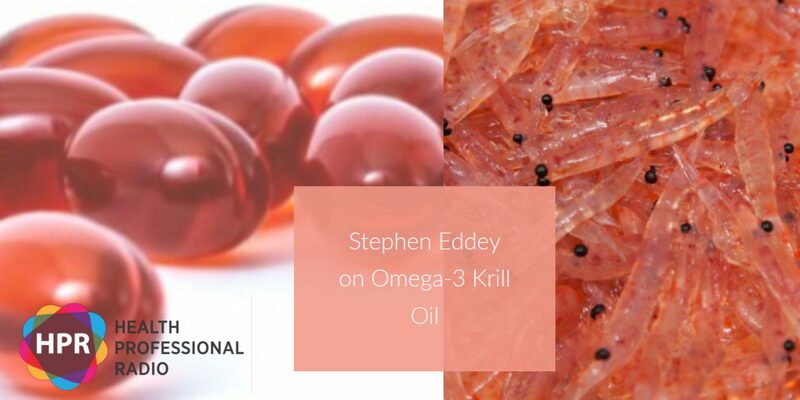 Naturopath, nutritionist and long-distance runner Stephen Eddey joins HPR to talk about the wonder benefits of Omega-3 krill oil. He also explains the differences between krill oil and fish oil which is another source of Omega-3 fatty acids. Stephen Eddey is the Principal and CEO of Health Schools Australia also known as the International College of Complementary Medicine, where he oversees seminar programs, core structures, and college administration. It’s the country’s longest established natural medicine college. Tabetha Moreto: Hello everyone. Welcome to Health Professional Radio. I’m your host for today, Tabetha Moreto. Our guest today is Stephen Eddey, Principal of Health Schools Australia, the country’s longest established natural medicine college. Today, we’re going to talk about Omega-3 krill oil particularly about its effect on athletic performance and recovery. Without further ado, welcome to the show Stephen. It’s so nice to have you here. Stephen Eddey: It’s great to be here. I love talking health. It’s my passion. N: My pleasure. That’s wonderful to know about your passion. So Stephen, can you please tell the audience more about yourself and the nature of your work? S: Sure. Yes. I started off life as a chemist in many years ago. Then in Queensland I became a naturopath, got a Bachelor of Complementary Medicine, Master of Health Science, got into teaching as you correctly pointed out and taught for about 30 years in Australia’s longest established college. Now, I’m doing some work with companies as a nutritional consultant. N: That’s wonderful to know. Now, I’m curious about Omega-3 krill oil. A lot of people are more familiar with fish oil. So, can you please explain, is there any difference between krill oil and fish oil? S: Sure. Krill oil has two important differences. The first one is it’s a phospholipid form which means it’s absorbed better and secondly it contains a chemical that makes it kind of red and the chemical is a natural chemical called astaxanthin. It’s a wonderful bonus, I guess, nutrient to the Omega-3 plethora benefits. N: That’s very interesting. As I mentioned earlier in the intro, that this can have a lot of benefits for athletic people. But I’m curious, can this be taken by someone like me who is not really an athlete? S: Well, we’re all athletes at heart. Now, we’ve all got hundreds of muscles to move. So absolutely, fish oil is really good for anyone and krill oil is even better. The reason for this is because our body requires fish oil to be used for many many functions but its main role is by reducing inflammation and it’s well known to reduce heart disease as well. You take it every day for non-athlete or athletes and it has been shown in several studies to be anti-inflammatory and particularly in heart disease. In this latest study for athletes shows that it’s very good for athletes. So when they have a run down immune system, when they get sick, or either a lot of these elite athletes get sick a lot, well one of the reasons is because their Omega-3 levels drop too low because if they’re in intense training. N: I see what you mean. Now, if you don’t mind can I ask you a personal question? N: Earlier you mentioned that you’re so passionate about natural medicine. Why are you passionate about it? S: Yes. It’s a great question. I’m passionate about it because when I was 20, I developed an arthritis in my spine. When I was a chemist working in Melbourne and it’s a couple of months off work, I was in hospital with it and natural medicine sort of saved me from becoming a sort of long-term arthritic person. Last year, I ran a marathon and I run every day and I went to the gym today, I don’t have any aches or pains in my joints anymore from the crippling arthritis. We had a very poor prognosis, just typical with arthritis people get worse. And I’m now completely cured from arthritis through natural medicine and that’s why I am more passionate about it than the average person because I know not think or guess, I know how much benefit can help people in their everyday life. N: Wow. That’s very interesting. Thank you so much for sharing your story. N: Can you tell us why is this topic relevant to other health professionals? S: Sure. Well, a lot of our health professionals are involved in athletes. You might have heard of physiotherapists and doctors are involved in athletes and also even podiatrists (with feet). The worst thing you can do for your performance is you can get sore muscles and all this other stuff but if you get sick like if you get a flu or a virus, that’s it – game out. You’re gone. You can’t compete at the optimal level. So if your immune system is healthy then you can protect yourself from getting any of these diseases and you can actually perform a lot better. That’s why everybody who is interested in health should be aware of this great krill oil studies showing that it helps the immune system of elite athletes. N: Wow. That’s wonderful to know. I would love to chat with you more but we’re running out of time. Before we go, what is your main takeaway message to all of our listeners out there? What would you like to tell them about krill oil? S: Look. Everybody should be on it. It’s essential for the human body. It’s not something that’s like a drug that’s artificial to the body. The Omega-3 oils, particularly EPA and DHA are essential for human function in the body. So everybody like yourself who is not an elite athlete, I’m not an elite athlete either, you may take it every day just for general health. It prevents against numerous diseases, arthritis. Yes, it’s great for your immune system as the study pointed out. So that’s good too. It protects you against heart disease. It’s been showing to benefit Alzheimer’s patients because your brain’s got a lot of fish oil in it – EPA and DHA in it. It’s extraordinarily beneficial for your joints as well. So with the 2.2 million Australians with arthritis and heart disease as our biggest killer, if we can do anything to reduce that then I think everybody should be taking krill oil. Also, the astaxanthin, the red part of it, is an excellent benefit to your eye health too. The benefits are absolutely incredible. Because there are virtually no side effects, everybody can take it every day. N: Well, that’s good news for me. Even though, I’m not an athlete I’m definitely going to try it out. S: Good on you. Yes, you’ve got to. N: Thanks, Stephen. Thank you so much. Before we go, how can people get in touch with you? S: Sure. Look. People can get in touch with me personally but there’s a great website. If everybody can Google Norseman study, that’s the study that we’re talking a lot about at the moment. It’s very very important and it’s really an important message that everybody goes out there and look at this study. Everybody can get onto Google and do that pretty easily themselves and look at the study and see how beneficial it is for athletes and as I said for everybody. N: That’s fantastic to know. Thank you so much for coming on the show. It was wonderful having you. N: And that was Stephen Eddey, Principal of Health Schools Australia. If you liked this interview, transcripts and archives are available at www.hpr.fm. We’re on all social media platforms. So don’t forget to follow like and subscribe. Show us some love by subscribing to our HPR YouTube channel. We’re also available for download on SoundCloud and iTunes. I’m Tabetha Moreto and you’re listening to Health Professional Radio.